We take pride in doing good for our community and for the world. Here are just a few things we have been up to as a congregation. An amazing and talented group of women from our congregation and around Cambridge get together and create these sleeping-mat beds. Some are shipped to third-world countries, and some are used right here in Cambridge. 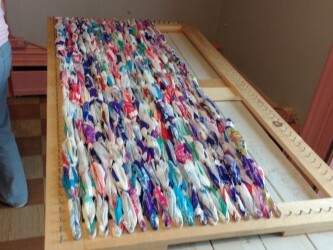 These beds are made by donated milk bags that are cut, chained together, and then woven to make durable beds that protect from ground moisture. If you would like to help out, we would love to collect your milk bags or even your time to help create these life-changing beds. The youth in our congregation getting together to plant trees. We are always working to make the world a better place, and we invite you to join us — no matter your age! Looking forward to seeing you! In addition to supporting local service agencies such as The Cambridge Self-Help Food Bank, The Alzheimer Society, Trinity Community Table, The Bridges, Haven House, and Sleeping Children Around the World, we stock our own cupboard of food which is available year-round to anyone who needs it. Thank you in advance to all who donate to the cupboard.